One of the first British newspapers to go online-only finds its readership falling behind its competitors and time spent reading the brand down by more than 70%. The study of The Independent reveals that since the newspaper dropped its print editions in March 2016, its British readership has declined, by around 1 per cent. This decrease contrasts with 12 other UK national newspaper titles that continue to publish print editions. Over the same period they have increased their readerships by an average of 25 per cent. 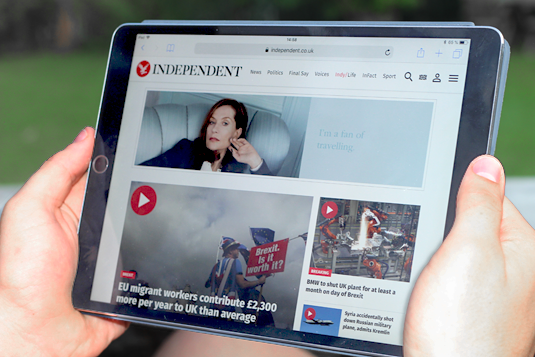 The study also shows that the total time spent with The Independent by its British audience is down by more than 70 per cent since the switch to online-only. In August, Karl-Heinz Ruch, Managing Director of the German newspaper die tageszeitung ("taz"), said that "the age of the printed newspaper is over" and that taz may soon no longer appear as a daily print edition. Dr. Richard Fletcher, co-author of the study and a research fellow with the Reuters Institute for the Study of Journalism at the University of Oxford, believes newspapers will persevere with print.